Cloud Backup Protection, Peace of Mind. Guaranteed. Secure cloud backup and storage for all your devices with one easy to use app. Loved by thousands of people and IT pros. Patented continuous backup technology and military grade security trusted to protect 350,000+ users and 500,000,000+ files. Protect data and devices from threat and loss with comprehensive security, administration, and recovery features. Guaranteed performance that meets PIPEDA, HIPAA, GDPR, and other stringent security and compliance needs. 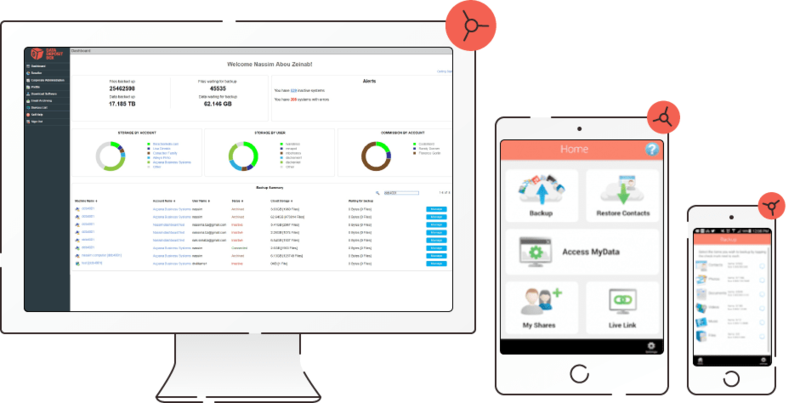 Backup, share, and remotely access all your data in one place. Backup an unlimited number devices to your account, including Windows and Mac OS servers and computers, iOS and Android mobile phones, Synology and QNAP NAS devices. My two year old hard drive crashed and everything was lost. I got a new hard drive right away and in a matter of minutes all my data was restored from DDB - even an email that I was working on when the hard disk failed! Our power went out and my computer crashed with a file open and unsaved. Three hours worth of work gone! As I headed for the top floor to throw myself out the window I remembered that I back up my data with DDB. I logged into my account, and there was my file in all its wondrous entirety. We were working on a large architectural design project and accidentally lost all the data. Within 15 minutes, we were restored everything we had lost via our DDB account. Without DDB, the data loss would have cost us over $8,000 in lost billable time. I used to spend 30+ minutes a day doing a daily backup. Data Deposit Box automates my backup and gives me the peace of mind that my data is secure and current. It’s extremely easy to use and requires only a basic understanding of computers. I highly recommend Data Deposit Box to other Doctors and Health Practitioners. We recently endured Hurricane Irene, and our office was located in a flooded area. Users were still able to access files, etc. through Data Deposit Box and it was a lifesaver for our company. I’ve tried xDrive, iBackup, and Connected, and your service is by far the best. I’m especially pleased with the real-time background continuous backup capabilities, and the ability to store multiple versions of files. Set CPU and bandwidth priority and utilization with the simple adjustment of a slider.